The Inditex model, celebrated in many a case study, goes like this. Other fashion firms have their clothes made in China. This is cheap, but managing a long supply chain is hard. By the time a boat has sailed halfway round the world, hemlines may have risen an inch and its cargo will be as popular as geriatric haddock. Inditex, by contrast, sources just over half of its products from Spain, Portugal and Morocco. This costs more. But because its supply chain is short, Inditex can react quickly to new trends. Instead of betting on tomorrow’s hot look, Zara can wait to see what customers are actually buying—and make that. While others are stuck with unwanted stock, Inditex sells at full prices. The genius of Mr Ortega’s model, says a former Inditex executive, is that it picks up on every season’s trends and is never associated with any one style, which could fall out of fashion. Alone among its peers, it does not advertise. Instead, it relies on chic locations and shop-window displays. 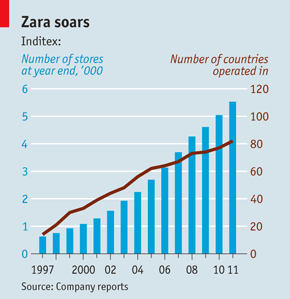 Rivals, however, argue that Zara is in fact associated with something: a gilded age of throwaway fashion. Now that tight belts are in, women may hesitate to buy a top and wear it only twice.